When most people picture the intersection of hippies and pop culture in New Mexico, they think of Dennis Hopper’s Easy Rider, not Bob Dylan. 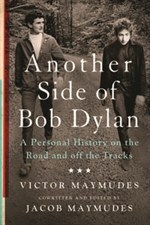 The boomer bard flew way under the radar here, but like Hopper he was friends with sometime Santa Fean Victor Maymudes, whose posthumous memoir Another Side of Bob Dylan traces his complicated four-decade friendship with arguably the greatest living songwriter. Told in the digressive prose of a nonlinear thinker dictating into a tape recorder, but brought to literary order by his son Jacob Maymudes, the book dishes enough only-in-New Mexico escapades and tell-all celebrity episodes to earn a spot on the nightstand of anyone interested in filling in details about the state’s quirky, larger-than-life cultural history. Who else can say they gave the Beatles their first joint? As a co-founder of the hip Unicorn Coffee House in Hollywood in the late 1950s, Maymudes knew everybody in the emerging Los Angeles scene, from Marlon Brando to Peter, Paul and Mary. A few years later, a friend introduced him to Dylan in Greenwich Village. The two became fast friends and chess buddies, though Dylan always held rank. Maymudes deferred to his genius, an Igor to Dylan’s Frankenstein, eventually becoming the singer’s right-hand man and tour manager. When Maymudes took a break from that gig, he bolted for New Mexico. If you blur out the celebrities and focus on the realities, his story carves much the same narrative arc as that of a thousand counterculture seekers who crash-landed in places like Taos, Llano, Placitas, Santa Fe, and Truchas in the late 1960s. With girlfriend Maggie Denver (whose ex-husband, Bob, played Gilligan on Gilligan’s Island), he headed for El Rito. Shortly thereafter, Maymudes broke up with Denver, met his future wife, Linda Wylie, in Taos, had two children with her, worked on films like Hopper’s ill-fated The Last Movie, applied carpentry skills to construction, and attempted a foray into Santa Fe home building. In 1974, Dylan asked Maymudes to find him property for a home in New Mexico. Unfortunately, the adobe Maymudes built—flanked by views outside Cerrillos—didn’t satisfy the notoriously prickly Dylan, who said the house reminded him of a hotel and abandoned any plans to live in New Mexico. “He never got what we saw in that piece of property or took enough interest to figure it out,” Maymudes said. “I really did not want to disappoint him.” In this period, Maymudes also lent support to local musicians like Lisa Gilkyson and staged a T-Bone Burnett concert in Tesuque. By 1987, Maymudes was broke, his Santa Fe construction business was foundering, and he’d split from Wylie, so he hit the road with Dylan again for eight years—touring, touring, touring. In the late 1990s, he and Dylan had an irreparable falling-out over a café in California run by Maymudes’ daughter, Aerie. (Jacob worked there, too.) Victor Maymudes died of a brain aneurism in 2001. Jacob grew up mostly around Santa Fe with Wylie. A fascinating person in her own right, she hand-built a stone house with a friend near Pecos over a 14-year period—much of Jacob’s childhood and adolescence. When that house burned down in 2013, absorbing the box of Maymudes’ ashes into its own charred remains, Jacob, now in his 30s, stirred himself to shape his father’s 24 hours of dictation into a book. He frames the memoir with his own experiences and commentary, including a wry, sad anecdote about Dylan kicking him out of the van for being an obnoxious seven-year- old—imagine the bragging rights around the Santa Fe Plaza. Sometimes Another Side of Bob Dylan betrays its cobbled-together structure. In the tour diary chapter, for instance, narrative progress skids off the tracks in a slather of mundane detail. Jacob’s commentaries can intrude or overshare, but he redeems it all in the final pages, describing his father’s last moments and the subsequent memorial service, when a shadowy figure on the margins just might have been Dylan. Did he come to pay last respects to his ever-constant friend? Mike Butterfield explores the elevated aspect of New Mexico’s split geographic personality in New Mexico’s High Peaks, looking at the over-12,000-foot mountains that define our heavenly skyline. Though not a trail guide, the book gives avid hikers enough beta (as climbers say) to start planning their next above-timberline lung-buster. If you’re an armchair mountaineer or serving exile in the flatlands, Butterfield’s juicy photos and breezy text on the natural and human history of our tallest mountains will help you replicate the experience in the comfort of your living room. Borrowing a fellow photographer’s aphorism as a mantra—“Being there is 90 percent of photography”—this camera-toting Albuquerque mountain man earned every photo in his lavishly illustrated book the hard way—hiking, backpacking, climbing, and snapping his way over New Mexico’s rooftops. His dedication shows. And while “being there” is a prerequisite, so is knowing what to shoot and, crucially, when. French photographer Henri Cartier- Bresson famously talked about the decisive moment. Butterfield applies that notion to bagging mountains, with their ever-shifting light and often-churning cloudscapes presenting a constant challenge. Apparently Butterfield accepted that challenge on or darn near every peak meeting his altitude requirement. His encyclopedic approach catalogs the named and unnamed skyscrapers from State Line Peak, at the Colorado line, south to Sierra Blanca, in the Sacramento Mountains. Actually, all the peaks above 12,000 feet lie in the Sangre de Cristo Range between Colorado and Santa Fe. Butterfield includes the lone southern outlier Sierra Blanca, although a recent, more accurate measurement trimmed it by 10 yards to 11,973 feet. Still, Sierra Blanca flaunts the gaudiest vertical relief, rising a staggering 7,800 feet above the Tularosa Valley. Butterfield, who also photographed Mike Butterfield’s Guide to the Mountains of New Mexico, opens by sketching the geography, history, and environment of “high New Mexico” and introducing the ranges graced by at least one “twelver.” The remaining chapters wander through each high-country range, giving brief text, a wealth of photos, and detailed captions. Butterfield concludes with a chapter ruminating on his definition of a peak, how he selected the peaks in this book, and handy lists of the mountains. A “Notes on Photography” afterword reveals his 40-year progression from a borrowed Pentax through medium-and large-format cameras to his current digital kit. Butterfield’s photo compositions can be intimate or grand, from a waterfall right here to a wilderness vista encompassing most of the Sangre de Cristos out there, from a sunrise-gilded contemplation of Truchas Lake to a sweeping panorama of the snowcapped peaks of the Wheeler Range above Taos. And by the way, he does precious little Photoshopping of his images. To help you share his appreciation of these mountains firsthand, Butterfield also dishes the outside dope on trailheads, access points, and even places to gawk from the car. If ever a book will make you want to hit the trail, New Mexico’s High Peaks is the one. For Diane Fresquez, an Albuquerque-born journalist now based in Europe, flavor is a complicated subject. Equal parts biochemical, situational, and psychological, it occupies a profound place in the way we make sense of the world. And its workings in the brain are often entwined so tightly that one bleeds into the others. But despite the frequent traces of memoir, the past isn’t the point. Instead, Fresquez has written a compelling exploration of the very real intersections of what we taste, why we taste it, what it might mean, and those dedicated scientists, perfectionist entrepreneurs, and tradition-loving craftspeople who make taste their life’s work. Written as a contribution to the Feminist Press and National Science Foundation’s Women Writing Science project, this book features mostly (but not exclusively) women, from the lab-coat-wearing yeast and flavor expert Sonia Collin to the eat-in-the-dark entrepreneur Patricia Raes. Fresquez’s journalist background is unmistakable; the writing is crisp, evocative, and inclusive. Drawing on her own memories of food and childhood—among them eating fry bread at the New Mexico State Fair—Fresquez illuminates that for all the importance we place on flavor and on the way things taste, the vast majority of us haven’t a clue how or why. Not only how or why particular combinations of molecules and chemicals do what they do to our physical selves but also how our minds and genetic histories play into it. To tease apart the science, Fresquez does what any good teacher does: finds the hook, the thing around which she (and we) can hang the story she wants to tell. She introduces a man hoping almost beyond hope to ferment a perfect, perhaps transcendental, perhaps even impossible mead. From him she turns to the role yeast plays in flavor, and then—well, then she’s down the rabbit hole. She explores custom flavor design, childhood preferences, the trigeminal nerve’s effects on what we like and dislike, and the sometimes significant differences between how men and women taste and its implications for food (and relationships). It makes for a quick read full of moments where you simply stop and contemplate how amazing it is that we function the way we do. There are a few missteps. The two capstone events (an in-the-dark dinner designed to test the role of smell in taste and the creation of that elusive mead) don’t live up to the ratcheting attention the author gives them as the book progresses. And then there are the recipes. They’re all fine, of course—sopaipillas, Dutch ham-and-endive gratin, for example— but they seem gratuitous. In the end, it doesn’t matter. The dinner happens, the mead turns out with some promise, and if one more reader discovers the glory of a hot sopaipilla dripping with honey, that can only be good. What more can you ask for from a science book, when it captures both the excitement of the chase and the details that give it meaning? Lucinda Lucero Sachs has set her new novel against the backdrop of 1920s and ’30s New Mexico, the turbulent era of the Great Depression and Democratic New Deal politics. 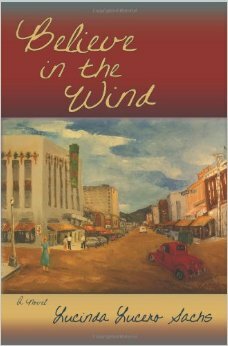 Last year, she gave us a history of this period, Clyde Tingley’s New Deal for New Mexico. She knows the territory well, and plies it skillfully. Governor Tingley and his humanitarian wife, Carrie, also make appearances in her latest book, as does Senator Dennis Chavez. Nea goes to school with the Sisters of Loretto, gets her first job after school at the Santa Fe New Mexican, and receives a political education from the editor, Jesus Candelaria. At one point Nea even pictures herself married to Jesus, but the core of the book has to do with the relationship Nea forms with Nicanor Roybal, who is making a successful run for the U.S. Congress. He woos her away from her job into his office, then into his bed; he begins to depend on Nea’s research and political insights, and her speechwriting.